IT 2 and The Nun are making their way to San Diego Comic-Con this year. New Line Cinema is holding their ScareDiego event during the convention for the second year in a row in order to show off their upcoming slate of horror releases. The event is slated to take place on Wednesday, July 18, which is known as preview night at SDCC. In addition to showcasing the follow-up to last year's IT and the latest spin-off in The Conjuring universe, the studio will also be making some surprise announcements. 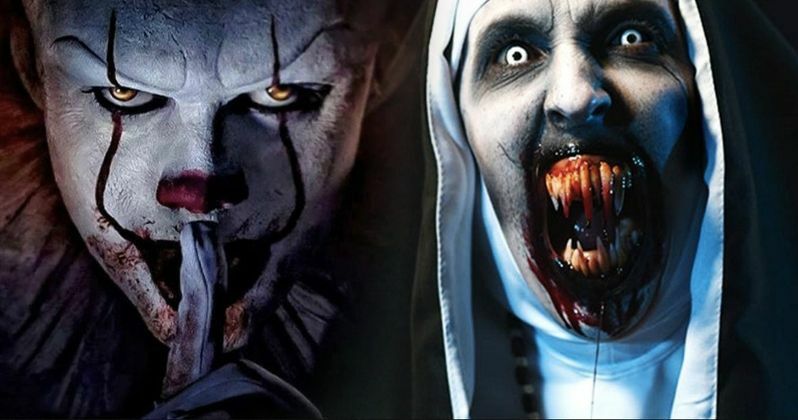 Last year, New Line got a jump on the competition at Comic-Con by showing off the very first footage from The Nun, as well as showing some scenes from IT and putting on a big showcase for Annabelle: Creation. Both IT and Annabelle: Creation went on to become massive hits at the box office. That's not to say the ScareDiego showcase is purely to thank, but this strategy clearly didn't hurt in building some hype for those projects. But the real question is, what are fans going to see this year and what might be announced? The Nun is set to hit theaters on September 7 and has been done filming for some time now. That means The Conjuring spin-off should get a big showcase during the event. As for what might be announced? We know that The Conjuring 3, Annabelle 3 and a spin-off centered on The Crooked Man are in development. Perhaps we'll get some formal announcements regarding those projects? It's also possible they could announce something totally out of left field that we can't possibly be expecting. Those in attendance could be in for some major surprises. Warner Bros. and New Line have had a tremendous amount of success with The Conjuring universe of movies so far and IT went on to become the highest-grossing horror movie of all time last year. Horror has become a real cash cow for them, but that's largely due to the fact that they've been delivering quality movies within the genre over the last handful of years. That should make ScareDiego a must-attend for those who will be on hand for San Diego Comic-Con during preview night on July 18. For those who will be there, the event is scheduled for 9:30 p.m. at the Horton Grand Theatre. This news comes to us courtesy of Deadline.